MIU France products are now distributed by Xinhua Corporation located in Bellevue, Washington USA. For North American Sales, (Wholesales and retailers only), please contact them at admin@xinhuacorp.com for additional information on how you can carry this fine line of kitchenware products. We have 180 full time production engineers and 40 full time artists working for our in-house engineering department, graphic design department and our photographic studio in Hong Kong. New products design, R&D, sales and marketing is performed by our sales team in Bellevue, Washington. We do all our own tooling. Our factories are fully equipped with the latest Silicone extrusion machines, stainless steel pressing and molding machines, CNC milling machines, CNC electrical discharge machines, and CNC wire cut machines. We have over 150 full time tooling technicians making new production molds everyday. Production: Our factories have over 110 fully automated plastic injection molding machines with molding capacities ranging from 80 to 100 tons. 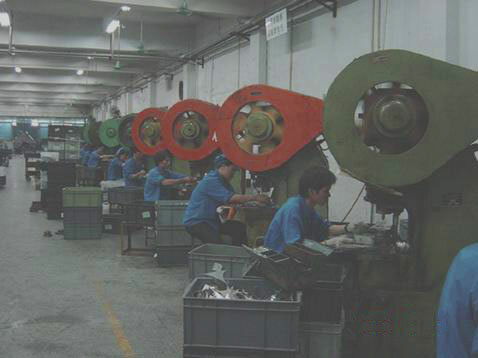 Such machines include our latest dual color double injection plastic molding machines, pressing machines with 10 to 300 ton capacities, and several metal sharpening machines. Our state-of-the-art stainless steel production line incorporates cutting, pressing, ultra sonic welding, polishing, stamping, tempo printing, etching, and assembly capabilities, with adjacent packing departments allowing us to carry out all manufacturing functions completely in-house.